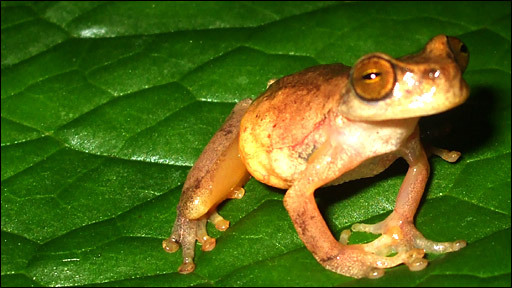 An extremely rare female frog has been spotted for the first time in 20 years. The tiny amphibian, Isthmohyla rivularis, is carrying eggs, suggesting that the species is doing well. The discovery was filmed by the BBC in the Costa Rican jungle as part of a scientific expedition with a team from Manchester University and Chester Zoo as they work on conservation programmes for rare frogs. Andrew Gray describes the find.